Charles Murray and his decades-old work on IQ and race, published in his 1994 book >The Bell Curve, is back in the news because of a mini feud between “new atheist” author and podcaster Sam Harris and Vox’s own Ezra Klein. Andrew Sullivan, the punditocracy’s original champion of Murray’s thinking on genetics, decided to jump in as well. Harris and Klein and Sullivan have, at this point, spilled plenty of words limning their disagreements. And Harris, for his part, sees himself as exclusively defending The Bell Curve’s empirical claims about IQ, which is fine, but it’s important to consider Murray’s work with a view toward actual American public policy, which has been deeply influenced by Murray over the years, and which Donald Trump is looking to take in an even more Murray-esque direction. The Bell Curve — co-authored with Richard Herrnstein — is, after all, not a work of scientific research but rather a political book written by one of the most prominent conservative policy entrepreneurs in America as part of a larger ideological project. Like several of Murray’s other books, including Losing Ground, In Our Hands, and Coming Apart, the basic subject of The Bell Curve is what should be done to help the disadvantaged in America. And the four books all reach the conclusion that, roughly speaking, we should do as little as is politically possible. What’s more, despite the mythmaking around Murray, nobody has silenced or stymied him. He is one of the most successful authors of policy-relevant nonfiction working in America today. He’s ensconced at the center of the conservative policy establishment as an emeritus scholar at the American Enterprise Institute. In 2016, he won the Bradley Prize, a prestigious conservative award that carries a $250,000 stipend. He regularly publishes op-eds in the Wall Street Journal. The New York Times reviewed Coming Apart twice. Tom Edsall featured it in a column (he says it raises “issues that are rarely examined with the rigor necessary to affirm or deny their legitimacy”), and David Brooks recommended it twice, lauding the “incredible data,” along with the analysis. PBS built an interactive around it. The technically precise description of America’s fertility policy is that it subsidizes births among poor women, who are also disproportionately at the low end of the intelligence distribution. We urge generally that these policies, represented by the extensive network of cash and services for low-income women who have babies, be ended. Murray’s ideas are plain wrong. Diversity is demonstrably good for society and the economy, not the reverse. Social programs can and do improve lives. Murray’s influence has damaged the interests of millions of people. Murrayism does harm on an ongoing basis, and, far from having been shut out of the discourse, it as at the heart of the ideological agenda that currently governs the United States. The Bell Curve is a long book that says a lot of things, many of which, as Murray’s partisans like to point out, are not especially controversial in academic psychology. By the same token, Karl Marx’s work is full of observations that are well within the consensus of the economics profession — that high levels of unemployment reduce wages for the employed, that firms seek to maximize profits, that market economies are prone to sporadic crises, etc. What makes a controversial book controversial is that some of its content and its major conclusions are controversial, and that is true — and then some — for Murray. as any government program we can imagine, is to make it easy for women to make good on their prior decision not to get pregnant by making available birth control mechanisms that are increasingly flexible, foolproof, inexpensive, and safe. Murray’s intellectual influence on the current trajectory of American immigration policy is obvious. His warning about the dysgenic impact of Latin American and African immigration is echoed by President Trump, who recently remarked that there are too many arrivals from “shithole” countries, and in the Republican Party’s ongoing conversion to the cause of sharp cuts in legal immigration. Trump’s immigration proposals do not specifically reference IQ, but his drive for a switch to what he terms a “merit-based” immigration system is clearly animated by a Murray-esque concern that the wrong kind of people are moving to the US. They offer a fourfold answer that consists entirely of hopes to change public policy for what they believe will be the better. The book concludes with the thought that since individuals differ in ability, a fair society in a procedural sense is very unlikely to be an egalitarian society in the sense of outcomes. Professional tennis tournaments, for example, are not a rigged game. Nonetheless, a tiny number of players amass the vast majority of the prize money. Not because anyone is cheating, but because some people are better than others at tennis. That’s not an unfamiliar point to political theorists; Michael Young’s 1958 classic >The Rise of the Meritocracy is a book-length critique of what he saw as an emerging elite of skill, and John Rawls’s landmark work of political philosophy, >A Theory of Justice, argues at length that a just society must offer a good dose of substantive equality and not just formal equality of opportunity for roughly the kinds of reasons Murray offers. That said, it must be noted that while Murray calls on elites to be a bit more humble about themselves, his work is very much not a call for substantive equality. One, he does not actually think that providing people with a UBI is a good idea. As he writes in his 2006 book, In Our Hands: “Imagine for a moment that the $2 trillion that the US government spends on transfer payments were left instead in the hands of the people who started with it. If I could wave a magic wand, that would be my solution.” The UBI is a compromise with the realities of public opinion, not something he backs on the merits. Two, his goal in promoting UBI is to make the welfare state less generous, not more generous. In exchange for creating a UBI, he wants to eliminate Social Security and Medicare, Medicaid and all other federal health programs, all means-tested social assistance (SNAP, Section 8 housing vouchers, TANF, and the earned income tax credit), and all federal assistance to students including veterans programs, Title I, and Pell Grants. Three, his UBI enacts a massive cut to total state spending on assistance — according to Murray, “as of 2014, the annual cost of a UBI would have been about $200 billion cheaper than the current system. By 2020, it would be nearly a trillion dollars cheaper.” To give a sense of scale here, all of Obamacare cost about $2 trillion over 10 years. Murray’s UBI would cut $1 trillion from social spending in one year. This is a plan to slash redistribution to the poor, not make it more generous. Importantly, Murray’s idea is that once we eliminate the entire welfare state, we will replace it with a UBI program that provides a flat level of financial assistance per adult. A single mom raising two kids would receive no more than a childless man, and a married couple with one child would receive more than the single mom. That somewhat defies common sense, but The Bell Curve’s preoccupation with the problem of “encouraging the wrong women” to have children clarifies that the goal is to avert the alleged dysgenic impact of improving the material living conditions of low-income children. Much of the rhetorical purpose of The Bell Curve seems to be devoted to muddying the waters between the claim that there are limits to how much reasonable policy interventions can do to equalize everyone’s abilities and social outcomes, and the claim that there is virtually nothing useful we can do with activist policy to help people. But while the former idea is well-grounded (so well-grounded that I’m not sure anyone denies it, including people who misguidedly, root and branch, reject the whole idea of general intelligence), the latter idea is completely wrong. Let’s think of the guy who is your complete screw-up. He drinks too much, he can’t hold on to a job, and he runs out of money 10 days before the end of the month. Well, under the UBI, he can no longer plead helplessness. His friends and his relatives can say to him, as they cannot say now, “Okay, we aren’t going to let you starve, but you’ve got to get your act together, and don’t tell us there’s nothing you can do, because we know you’ve got a thousand bucks hitting your bank account next month. You’ve got to start dealing with your problems.” That’s good. That kind of interaction, multiplied millions of times around the country, is having friends and relatives deal with human needs in ways that bureaucracies inherently are unable to deal with them. Murray’s arguments about the spiritual inadequacies of social welfare provision are baffling to me, but the IQ-based argument mooted in The Bell Curve at least makes sense. Because people’s underlying capacities vary considerably, you’re not going to design a social policy that overcomes that intrinsic inequity. That’s almost certainly true. Given everything we know about athletic ability, for example, it’s clear that no matter what we do, some people will always be more adept skiers than others. On the other hand, there’s also an obvious reality that most Americans (myself included) don’t get taught to ski as kids, and consequently, the whole average level of skiing competency in the United States is much lower than it could be if we set about trying to raise it. Now, of course, a massive national campaign to make us all better skiers would be a stupid waste of time and resources. Meanwhile, though creating a school that is consistently better than an average school is (for understandable reasons) quite difficult, it appears to be possible and it does work — and not just for a narrow cognitive elite. Certain charter school networks produce consistently superior results — especially for low-income and minority kids — compared to mainstream public school systems. And Roland Fryer has shown that traditional unionized public schools that adopt some of these charters’ main pedagogical innovations produce similar results. Individual schoolteachers vary in quality (like practitioners of other professions), with students taught by average teachers earning significantly more as adults than those taught by teachers in the bottom 5 percent of the distribution. A year’s worth of instruction by a great teacher induces $400,000 in additional earnings from a 20-student classroom. Something as simple as judicial decisions mandating that states equalize their school funding formulas seems to produce positive educational results for poor kids. All of which is to say that the fatalism Murray promotes about social betterment is entirely misguided, and attempting to implement his reform of the welfare state would lead to not only massive short-term suffering but a massive erosion of our long-term prospects as a society. Yet unfortunately, Murray-style thinking is already very influential in American politics. Despite the popular claim among Murray supporters that he’s been silenced and unfairly maligned, his views have shaped — and still shape — American policy outcomes. Though the United States is generally quite a bit richer than Western Europe, the material living standards of American children are generally worse, with about 11.8 percent of US children living in absolute poverty (as indicated by the US poverty line), compared to only 6.2 percent of German or 3.6 percent of Swedish children. 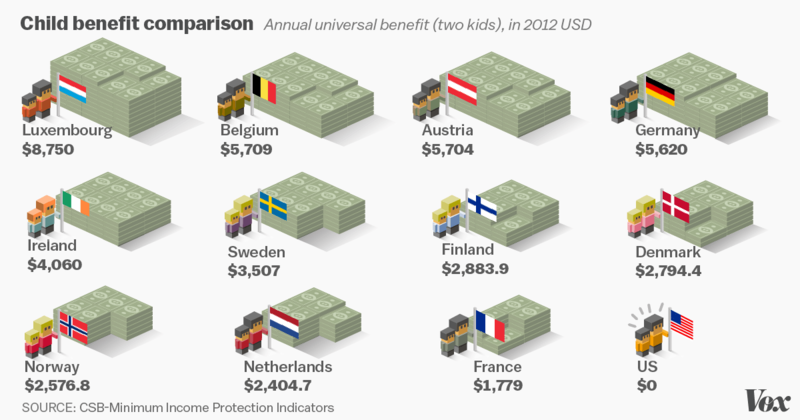 This is in large part because the US is already an outlier in terms of its refusal to provide cash support to parents. Instead, the United States essentially eliminated substantial cash assistance to poor mothers in the mid-1990s. Murray’s biography page at All-American Speakers boasts that Murray provided “the intellectual foundation for the Welfare Reform Act of 1996,” and the fee for a Murray speech is in the $20,000 to $30,000 range. Altering the old, and genuinely very flawed, welfare system in Murray’s preferred direction rather than moving toward a universal child allowance meant that not only did the United States maintain its abnormally high level of child poverty, but it witnessed a substantial increase in deep poverty. This relates in important ways to intelligence. A growing body of academic research — which includes DNA testing to control for potential genetic factors — indicates that the stress of growing up in poverty does concrete neurological damage to children’s brains over and above the issues with exposure to toxic chemicals. Murrayism traps poor children in a cycle where they have worse opportunities for intellectual development and then that underdevelopment is used as evidence that little can or should be done to improve their economic status. And Republican politicians are seeking to proceed piecemeal with the Murray approach to social policy. Congressional Republicans made several runs at rolling back Medicaid expansion, and now the Department of Health and Human Services is working with GOP-run states to try to tighten eligibility requirements and reduce enrollment. State-level action to make SNAP benefits harder to access has become routine, and the GOP only dropped its plans for a big 2018 push to apply “welfare reform” principles to in-kind benefits programs because Democrat Doug Jones’s Senate special election win ensured the votes wouldn’t be there. Murray’s views on immigration policy have emerged as the dominant school of thought coming out of the White House and are supported by the Republican Party as a whole, despite evidence that the restrictionism has no society-wide upside. Even small aspects of this agenda that are already being implemented, like the rollback of the Deferred Action for Childhood Arrivals program, are economically harmful to most native-born Americans and the overwhelming preponderance of economic evidence suggests that the larger restrictions now on the table would have an even bigger negative impact on the economy. Concern about the dysgenic impact of immigrants and assistance to low-income families, in short, has in fact become an impediment to both overall national prosperity and specifically to poor kids’ brain development and life prospects. And racial demagoguery is a key reason why. What does race have to do with any of this? One thing Murray’s defenders tend to get more right than his critics is that the racial portions of The Bell Curve are relatively marginal to the overall project (as Nathan Robinson writes at Current Affairs, Murray’s bizarre non-policy book Human Accomplishment makes far more provocative claims on race), which, despite its prurient interest in racial gaps, is fundamentally about economic class. 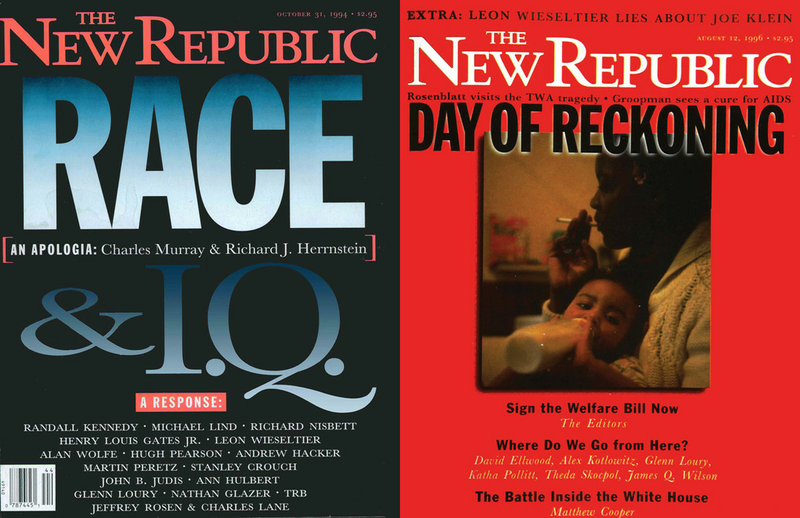 Race is, however, central to the political project of maintaining a stingy welfare state. Indeed, cross-sectional evidence marshaled by Alberto Alesina and Ed Glaeser for their 2004 book, >Fighting Poverty in the US and Europe: A World of Difference (you can read their main findings here) concludes that racial animosity is the main explanation for America’s relative stinginess to poor families while experimental evidence shows that increasing the salience of racial conflict promotes reactionary politics and specifically confirms that associating means-tested social assistance with black people leads many whites to become more skeptical. African Americans and Latinos are disproportionately poor in the United States, but most recipients of social assistance are, in fact, white. Despite the complaint that critics are throwing around charges of racism to silence Murray, the reality is that promoting a heavily racialized view of the overall question of whether we should try to help poor families or punish them serves as a useful marketing gimmick for both books and legislation. Murray does have a side agenda that is race-specific, however. Near the very end of The Bell Curve, he writes, somewhat euphemistically, “that group differences in cognitive ability, so desperately denied for so long, can best be handled — can only be handled — by a return to individualism” rather than with policies that seek to specifically address or remedy racism or racial disadvantage. But Murray’s critique of affirmative action admissions, though incorrect, is a politically influential viewpoint in the United States rather than one in desperate need of signal-boosting. The Justice Department is backing away from consent decrees that aim to address racial inequities in policing, the Department of Housing and Urban Development is gutting fair housing enforcement, and a ProPublica report last year revealed a broad administration-wide push for all agencies to scale back civil rights enforcement generally. Instead of waging war on racial discrimination, the Trump administration is, in line with Murray’s recommendations, waging war on affirmative action policies. The reality, however, is that the evidence that race-specific disadvantages exist and that race-specific remedies can help is overwhelming. That women earn less than men and black people earn less than white people in America is well-known. But a landmark new study published last month by the Equality of Opportunity Project found a striking pattern in the interaction of these issues. While black women earn less than white women, that earnings gap essentially vanishes when you account for the fact that white women on average have richer parents than black women. But the earnings gap between black men and white men persists even with this control. There is no plausible genetic explanation for this. Instead, it seems that black men suffer from a race-specific disadvantage that impairs their earnings. This, in turn, reduces the material living conditions of black girls, which impairs their earnings too. The exact mechanism at work is unclear, though the gender specificity suggests that perhaps the criminal justice system is playing a key role. It’s also important to understand that while Murray’s specific remarks about race science tend to be hedged and a bit vague, and at times to profess a fair degree of agnosticism about the actual magnitudes, his discussion of why this is worth bringing up at all is very clear and sweeping — he believes, despite vast evidence to the contrary, that America needs to stop thinking about racial discrimination and race-conscious solutions. It seems almost ridiculous to need to argue this, but racial discrimination is a quite real and salient feature of American society. Employers, for example, discriminate against job applications that feature stereotypically “black” names, and so do public officials when deciding what correspondence to answer. But conversely, attentiveness to race can be useful in crafting policy solutions. Early studies of racial matching (or lack thereof) between teachers and students showed that black teachers have higher academic expectations for black students than non-black ones have. More recent inquiry shows that this has concrete effects, with black students seeming to learn more from black teachers. Promoting the message that African Americans suffer from irremediable intellectual incapacity would be actively harmful in this context, while trying to take affirmative measures to ensure fairer treatment of black students and adequate representation of African Americans as classroom leaders would make it better. Similarly, an earlier study from the Equality of Opportunity Project showed that black and Latino kids with exceptional math skills are less likely to grow up to be inventors than similarly skilled white and Asian kids, and the research offered some suggestive evidence that a lack of role models may be an issue here. And understanding the existence of discrimination in the labor market is critical to understanding the impact of different micro and macro policies. That includes everything from the finding that employer drug testing helps black job applicants because it lets them overcome negative stereotypes to the fact that African Americans benefit disproportionately from aggressively pro-employment monetary policy because a tight labor market makes discrimination more costly for employers and thus more surmountable. Race, in short, continues to be a real and underrated factor in how American social and economic institutions function. And while raising the salience of racial issues can be counterproductive in some contexts by undermining political support for anti-poverty measures, it can be critical in other areas to improving the way schools, labor markets, and the criminal justice system work. To put it bluntly, insisting that we pay more attention to ambiguous evidence about the role of IQ heritability in driving group differences is not a disinterested gesture of scientific inquiry, but a political move initiated by political polemicists who aim to heighten racial salience where it’s counterproductive and diminish it where it could be constructive. People of goodwill who really do simply believe in open inquiry ought to take a good, hard look at the overall context in which this topic arises and think carefully about what exactly it is that they are trying to say. Though he tends to back away from it under pressure, Murray is admirably clear in the conclusion to The Bell Curve and elsewhere about why he thinks it’s important to discuss IQ and heredity — he believes that focusing on this issue will build political support for restricting immigration from poor countries and reducing economic assistance to poor families. As a bonus, he hopes that throwing in specific hypotheses about group differences will build political support for eliminating race-conscious policymaking and curbing efforts to address race-specific disadvantage. The truth, however, is that these are not underrated policy ideas that are in need of amplification in the public arena. They are, rather, terrible policy ideas that currently exert more influence over policymaking than they deserve and ought to be rebutted. Scientific exploration of human genetics, of course, ought to continue, and we ought to be open-minded about what it may discover. From what we know so far, it really is clear that smart parents tend to have smart kids, but it is also very clear that a wide range of policy interventions, ranging from environmental cleanup to social welfare provision to improving schools, raise kids’ cognitive abilities and improve their labor market outcomes. It is also very clear that race is significant as a social phenomenon in the United States in ways that create meaningful disadvantages for members of minority groups and that attention to racial issues can lead to better outcomes. Genetic research can tell us things about the harmful implications of racial inequities. Biomedical research on the development of pharmaceuticals and other health care technology, for example, often does not reflect the ethnic diversity of the American population, which means that we are often developing health interventions that don’t serve minority groups effectively. Sam Oh, an epidemiologist at the University of California San Francisco Center for Genes, Environment, and Health, offered as an example to NPR that “African-Americans and Puerto Ricans don’t respond as well to some of the most common asthma controller medications,” even though these groups would benefit enormously from more effective treatment, since they are disproportionately likely to live in high-contaminant environments where asthma is common. But to say that actual scientists should continue doing scientific research into the genetic bases of human cognition is a far cry from saying that lay journalists and policy analysts ought to go out of our way to promote the hypothesis that America’s class system reflects irremediable aspects of human biology. This is an idea that exerts too much rather than too little influence over American politics and public policy, and the racialized version of the hypothesis that Murray is known for is particularly damaging. The notion that poor families deserve less help than they get because they are a cognitively disadvantaged group who will respond to assistance via overbreeding that undermines the quality of the national stock is not an unexplored suggestion in American history. But it is a uniformly pernicious one that continues to exert a powerful negative influence on the lives of millions of people — reenforcing traditional status hierarchies while immiserating the country as a whole by preventing vast swaths of the population from reaching their full potential to prosper and contribute.